A London judge fined Sidney Turner three pounds, ten shillings for “creating an abominable noise” after Turner threatened his neighbors by saying, “I will drive you mad.” Turner played Bill Haley And His Comets‘ “Shake Rattle & Roll” as loud as possible from 2 p.m. to 4:30 p.m.
Chuck Berry’s “Maybellene” reached #5 pop while spending eleven weeks at #1 on the R&B hit list. Elvis Presley played his third and last concert in Canada, the only concerts performed outside of the USA; 26,000 fans attended the show with tickets costing $1.50, $2.50 and $3.50. Vancouver DJ Red Robinson MCed Elvis in 1957 and The Beatles in 1964 on the same stage. 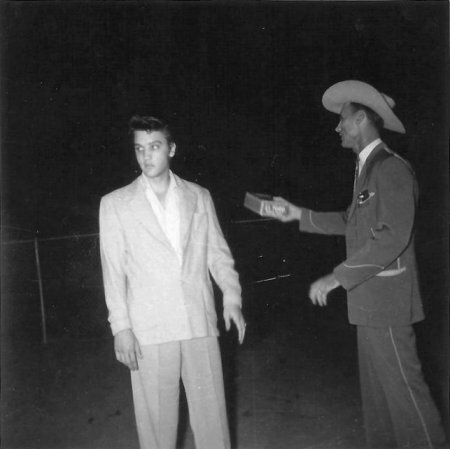 MANDATORY PHOTO CREDIT: Collection of Red Robinson/ Elvis Presley with Vancouver disc jockey Red Robinson before his concert at Empire Stadium on Aug. 31, 1957. Elvis performed at the Empire Stadium, Vancouver, British Columbia. Vancouver DJ & Concert MC Red Robinson recorded this concert, which has not been released in full or officially. Scotty Moore – Empire Stadium – Vancouver. B.C. Memories of Elvis in Vancouver, B.C. Ricky Nelson kicks off his musical concert career by appearing at Steel Pier in Atlantic City, New Jersey, where he sets an all time attendance record for the venue by performing in front of 44,221 people, spread out over two days. His fee for the gig was $10,000 and his supporting acts were comedian Henny Youngman and The Four Preps. The Shirelles, ben E. King, Little Eva, Chuck Jackson, Dee Dee Sharp, the Marvelettes, the Ronettes, the Del-Satins, the Majors and Tony Orlando (years before Dawn) performed at Murray the K’s annual New York Labor Day Rock ‘n’ Roll show at the Brooklyn Fox Theater. The Angels become the first white girl group to have a US number one hit when “My Boyfriend’s Back” topped the Billboard Hot 100. The Ronettes first entered the US singles chart with ‘Be My Baby’ the girl group’s only top 10 hit. Lead singer, Veronica Bennett who became Ronnie Spector, took producer and ex-husband Phil Spector to court in the late 1990s for unpaid royalties. 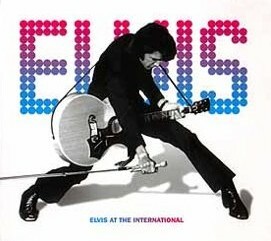 The Elvis Presley single “Your Time Hasn’t Come Yet, Baby” hit #22 in the U.K. The Beach Boys release their album, “Sunflower”, which, despite enthusiastic critical reception, would stall at #151 on the Billboard 200 LP chart during a brief four week stay. With record buyers focusing on the likes of Black Sabbath, Neil Young, Simon And Garfunkel, Creedence Clearwater Revival and others, the effort would become their poorest performing album up to that time. Elvis did Dinner and Midnight Vegas Shows. Paul McCartney receives a Gold record for “Live and Let Die”. In a US federal court, John Lennon testifies that he believes the Nixon administration tried to have him deported because of his involvement with the anti-war demonstrations at the 1972 Republican convention in Miami. He also suspected his phones were tapped and that he was under surveillance by government agents. Elvis performed on tour at the Coliseum, Macon, Georgia. ‘Purple Rain’ the movie-starring Prince opened at cinemas across the UK with special late night previews. The film grossed more than US $80 million at the box office and became a cult classic. Twenty years after it originally topped the UK chart for Sonny And Cher, “I Got You Babe” was a number one hit all over again for UB40 and Chrissie Hynde. The largest pre-order of albums in the history of CBS Records occurred as 2.25 million copies of Michael Jackson’s ‘Bad’ album were shipped to record stores in the US. The LP followed the Jackson album, Thriller the biggest Jackson-seller of all time (over 35 million copies sold). ‘Bad’ went on to sell over 13 million copies. Metallica started a four-week run at No.1 on the US album chart with, Metallica. The album featured ‘Enter Sandman’ ‘Sad But True’, ‘The Unforgiven’ and ‘Nothing Else Matters’ went on to sell over 10 million copies in the US alone. Elvis performed at the Baseball Park, Gonzales, Texas. Military service Fort Hood in Texas. Elvis Presley’s album “Something For Everybody” hit #1 in the U.S.
Sonny & Cher were at No.1 on the UK singles chart with ‘I Got You Babe’, the duo’s only UK No.1. Sonny Bono was inspired to write the song to capitalize on the popularity of the term “babe,” as heard in Bob Dylan’s ‘It Ain’t Me Babe’. The Beatles held a press conference at University College in Bangor, North Wales with Maharishi Mahesh Yogi. The Beatles announced that they had become disciples of the guru and that they renounced the use of drugs. The four had become members of the Maharishi’s ‘Spiritual Regeneration Movement’, which obligated them to donate one week’s earnings each month to the organization. Elvis and Priscilla arrived home from Vegas to Memphis at 8.20 a.m.
Apple Corps releases five single records, including The Beatles’ “Hey Jude” backed by “Revolution”. It will become the band’s biggest hit. Jeannie C. Riley’s “Harper Valley P.T.A.” was certified Gold. The single eventually sold more than six million copies and Riley became the first woman ever to top the U.S. Pop and Country singles charts with the same song. Elvis Presley released “Suspicious Minds,” his 18th and last lifetime #1 single in the U.S.
Elvis did Dinner and Midnight Vegas Shows. While the show was still being taped by RCA, Elvis couldn’t stop laughing during Are You Lonesome Tonight. The new feminist movement in America, led by Betty Friedan, staged a nationwide Women’s Strike for Equality. There was a warning that Elvis would be kidnapped somewhere during the night and extra security was added at the hotel. The date was declared Women’s Equality Day by U.S. Presidential Proclamation, to commemorate the 19th Amendment passed in 1920, which gave the vote to American women on a basis equal to men. Tonight’s shows were canceled due to exhaustion of Elvis. US Cinematographer David Myers died after suffering a stroke. He worked of various music films including Woodstock, Elvis On Tour, The Last Waltz, The Grateful Dead Movie, Mad Dogs & Englishmen and Cracked Actor: A Film About David Bowie. After accusing the Estate of Michael Jackson of undervaluing a number of Jackson’s assets by hundreds of millions of dollars, the Internal Revenue Service issued the estate a $702 million bill for federal taxes and penalties. The estate followed by filing a court challenge to the bill. Priscilla Presley and ex-Marco Garibaldi Spent $50 Million Of Elvis . Inventor Thomas Edison filed for a patent on his motion picture camera. Called a kinetoscope, the camera took pictures on a band of film that could be viewed by peeping into a box. Elvis performed at the Davy Crocket High School Football Stadium, Conroe, Texas. Buddy Holly was in the audience as Little Richard played the Cotton Club in Lubbock, Texas. Soundtrack recording began on the Fox soundstage and run from 1.00 to 6.00 p.m. and Elvis had to work with studio musicians instead of with Scotty, Bill and DJ. Elvis returned to Fort Hood: Military service Fort Hood in Texas. A headline in Billboard reads, “Rock and Roll Ain’t Ready For The Ol’ Rockin’ Chair Yet.” The story says that Rock ‘n’ Roll was losing popularity a year ago, but record buyers now like Elvis Presley, Lloyd Price and Fats Domino along with newcomers, The Everly Brothers, The Drifters and Ricky Nelson. The Browns, who were Jim Ed Brown and his sisters Maxine and Bonnie, had the top tune in the US with “The Three Bells”. The record is an English version of a French song originally titled “Les Trois Cloches”, written in 1945. The Beatles’ single “She Loves You” with “I’ll Get You” on the flip side is released in the UK. It will enter the British charts on August 31st and remain there for thirty-one consecutive weeks, eighteen of those in the top three. After a couple of flop singles for smaller record companies, The Ronettes scored their only Billboard Top Ten hit when their first effort for Phil Spector, “Be My Baby” rose to #2. None of their other records, including “Baby I Love You” (#24), “The Best Part of Breaking Up” (#39), “Do I Love You?”, (#34) and “Walking In the Rain” (#23) could crack the US Top 20. Darlene Love‘s biggest solo hit, “Wait Til’ My Bobby Gets Home”, enters the Billboard chart, where it will top out at #26. She had greater success when she sang for The Crystals, The Blossoms and Bob B. Soxx And The Blue Jeans. Stevie Wonder became the first artist ever to score a US No.1 album and single in the same week. Wonder was at No.1 on the album chart with ‘Little Stevie Wonder / The 12 Year Old Genius’ and had the No.1 single ‘Fingertips part 2’. This was also the first ever live recording to make No.1. Beatles manager Brian Epstein met Elvis Presley’s manager “Colonel” Tom Parker for the first time when they had lunch at the Beverly Hills Hotel. The Colonel had offered to help them while in the U.S.
Elvis continued his spiritual studies with Larry Geller in Memphis as well as screening movies at the Fairgrounds or the Memphian. The Doors started recording their first album at Sunset Sound Recording Studios, West Sunset Boulevard, Los Angeles, California. With their military’s explosion of a hydrogen bomb in the South Pacific, France became the world’s fifth thermonuclear power. The soundtrack album to the Elvis Presley movie “Speedway” hit #82 in the U.S.
Arlo Guthrie’s movie, Alice’s Restaurant opens in New York and Los Angeles. While Guthrie wrote the lyrics and music for the song “Alice’s Restaurant Massacree”, he did not write the screenplay for the film, which was instead co-written by Venable Herndon and Arthur Penn. John Lennon writes “Cold Turkey”, a song about kicking his heroin addiction. He rehearsed the song all afternoon and recorded it that evening with the help of Ringo Starr and Klaus Voorman. When it was released, critics hated it and the BBC refused to play it, yet somehow it still made the UK Top 20 and the US Top 30. 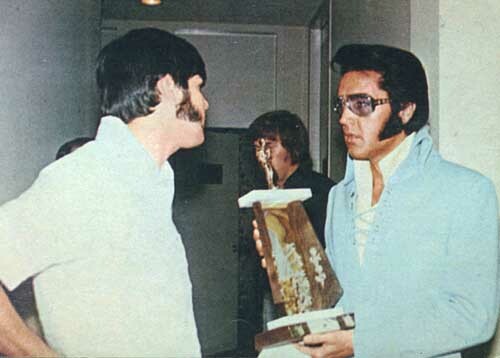 Canadian Fan Club President Claude Laliberte with Elvis. Paul Anka with Odia Coates started a three week run at No.1 on the US singles chart with ‘(You’re Having My Baby’, Anka’s 24th US top 40 hit. It made No.6 in the UK. The album “Elvis Recorded Live On Stage In Memphis” hit #44 in the U.K.
After the midnight show Elvis painted on e of the decorative angels on the showroom wall black, and about this he told the audience in the following shows, pointing out his handiwork. T he former member of Buddy Holly’s backup band turned Country star,Singer, songwriter Waylon Jennings was arrested and charged with possession of cocaine. Jennings had recently been named an honorary police chief. Mark Chapman was given a 20 year jail sentence for the murder of John Lennon. The 25 year old had shot Lennon five times at close range on December 8th, 1980 in front of The Dakota apartment building in New York City. Over the next few months, Chapman would claim many times to have been beaten by fellow inmates, some of whom allegedly tried to kill him. The U.S. space probe Voyager 2 sent back to Earth photographs of the planet Neptune. The Who performed Tommy at the Universal Amphitheatre, Los Angeles with special guests Steve Winwood, Elton John, Phil Collins, Patti LaBelle and Billy Idol. Judas Priest successfully defended themselves against a lawsuit, after two fans attempted suicide while listening to the Stained Class album. Both fans eventually died, one immediately from a shotgun blast, and the other on a second attempt three years later by a methadone overdose. The prosecution claimed that there were subliminal messages in the group’s music that caused the two seventeen year olds to carry out the suicide pact in 1985. Lenny Kravitz was at No.2 in the US singles chart with ‘It Ain’t Over Till It’s Over’, held off the No.1 position by Bryan Adams ‘(Everything I Do), I Do It for You’. The Elvis Presley three-CD boxed set “Collectors Gold” hit #57 in the U.K. The Elvis Presley compilation album “The Collection” was released by RCA. “Elvis Presley – The Signature Collection (It Happened at the World’s Fair / Speedway / Spinout / Harum Scarum / Jailhouse Rock / Viva Las Vegas)” was released in a six DVD set. A Las Vegas mansion once owned by Liberace was sold for $500,000 to a British businessman. The ten-bedroom, two-bathroom home, built in 1962, sold for about $3 million more than that just seven years ago. The Country Music Hall of Fame and Museum in Nashville hosted an invitation-only memorial for Glen Campbell. Among those appearing were Jimmy Webb, who played a piano/vocal version of “Wichita Lineman”, as well as Mike Love, Bruce Johnston and the current Beach Boys line-up who performed “I Get Around”, one of numerous titles that Campbell played on as studio musician. 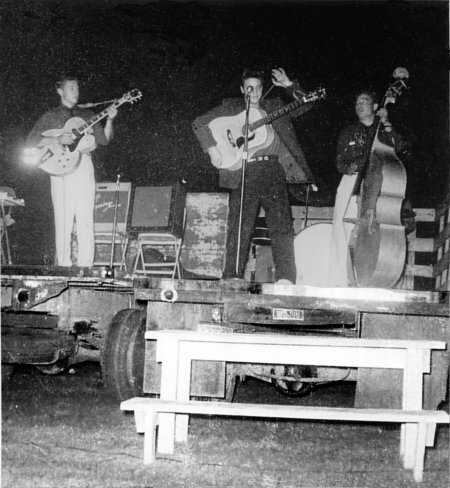 Elvis performed on a flatbed trailer was used for the stage at the Bryan Saddle Club (Brazos County Rodeo Arena) Bryan, Texas. The Elvis Presley film “Loving You” opened in London. John Lennon marries his pregnant girlfriend, Cynthia Powell at the Mount Pleasant Registry Office in Liverpool. Paul and George are the only others in attendance. Efforts to keep the marriage quiet were dashed when they were spotted coming out of the registry office. He then played a gig that night with The Beatles at Liverpool’s Riverpark Ballroom. The Rolling Stones appeared on UK TV show Ready, Steady, Go! for the first time, performing their debut single ‘Come On.’ The group made a total of 20 appearances on the show between 1963 and 1966. Security guards at a Manchester TV studio hosed down 200 Rolling Stones fans after they broke down barriers while waiting for the band to arrive for a performance. On their final tour of America, The Beatles performed at Shea Stadium in New York City, New York. Unlike the previous year’s performance, which had sold out, there were 11,000 empty seats in the 55,600 seat stadium. The Beatles earn more than the previous year, receiving $189,000 for their performance. Elvis and Priscilla with the group in Las Vegas, having been sent by Col Parker due to an unrelated vehicle accident near Elvis Bel Air home. Ringo Starr quits The Beatles during the recording sessions for “The White Album”, telling John “I’m leaving the group because I’m not playing well and I feel unloved and out of it and you three are really close.” Believing that his time with the band was over, Ringo and his family went on vacation to Sardinia. Ibex, featuring vocalist Freddie Bulsara (later known as Freddie Mercury) played a gig at the Octagon Theatre, Bolton, Lancashire, UK. The Rolling Stones started a four week run at No.1 on the US singles chart with ‘Honky Tonk Women’ the group’s fifth US No.1. The record also made #1 in the UK. It was the last hit that included original guitarist Brian Jones, who had drowned in his swimming pool on July 3rd. Johnny Cash started a four-week run at No.1 on the US album chart with ‘Johnny Cash At San Quentin’. The album was a recording of a live concert given to the inmates of San Quentin State Prison and was the follow-up to Cash’s previous live album, the critically acclaimed and commercially successful At Folsom Prison. Lou Reed and the Velvet Underground performed together for the last time at the New York Club ‘Max’s Kansas City’. That’s the Way It Is Production/ Elvis did Dinner and Midnight Vegas Shows. Funeral services held for Alice Hovartar and Juanita Johnson, both 19, killed when a car crashed into the Graceland mourners. Jerry Leiber, a songwriting legend whose credits include “Hound Dog”, “Jailhouse Rock”, “Yakety Yak”, “Poison Ivy” and “Love Potion Number 9”, died at the age of 78. Leiber and his songwriting partner Mike Stoller were inducted into the Songwriters Hall of Fame in 1985 and the Rock and Roll Hall of Fame two years later. Comics Bill Buchanan and Dickie Goodman have the number three song in America with a novelty tune called “Flying Saucer”. The premise of the record was two radio news reporters who ask questions which are then humorously answered with snippets from mid-’50s hits. Buchanan and Goodman were sued by 17 different record companies for copyright infringement, but all were dismissed by a ruling that said the parodies did not infringe on the sales of the original records. Elvis bought two stone lions and had them installed on either side of the steps leading up to Graceland. Tamla Records released the Marvelettes first single, ‘Please Mr. Postman’. The song went on to sell over a million copies and become the group’s biggest hit, reaching the top of both the Billboard Pop and R&B charts. The song is notable as the first Motown song to reach the No.1 position on the Billboard Hot 100 pop singles chart. Patsy Cline recorded the classic Willie Nelson song, ‘Crazy’. Cline was still on crutches after going through a car windshield in a head-on collision two months earlier and had difficulty reaching the high notes of the song at first due to her broken ribs. ‘Crazy’ spent 21 weeks on the chart and eventually became one of her signature tunes. Elvis Presley started a three-week run at No.1 on the US album chart with ‘Something For Everybody’ his sixth US No.1 album. Gary Pepper and Elvis | August 21st 1962, taken after private movie evening,screened by Mr Paul Shafer, Malco theatre, Memphis. The Rolling Stones started a three week run at No.1 on the US album chart with ‘Out Of Our Heads’ the group’s first US No.1 album. On their last ever US tour The Beatles performed in two cities due to a cancellation due to rain the previous day. First they performed at Crosley Field in Cincinnati, Ohio. Then they flew to St. Louis, Missouri, for a concert at Busch Stadium, where they performed under a tarpaulin due to heavy rain. It was this gig that convinced Paul McCartney that The Beatles should stop performing live. The Doors started recording their second album at Sunset Sound Studios, Hollywood, California. In the morning Elvis completed looping on Speedway and after lunch he had makeup tests for his next picture, Stay Away, Joe. Tommy James and The Shondells returned to the UK No.1 position for the second time with the single ‘Mony Mony’. In a peculiar twist, in 1987 Billy Idol’s version of the song replaced another Tommy James hit at No.1 on the Billboard Hot 100 — ‘I Think We’re Alone Now’, covered by Tiffany. The Dinner Las Vegas show as attended by Elvis’ Grandma Minnie Mae Presley and Aunt Delta Biggs. Arthur Brown’s Kingdom Come, Hawkwind, Duster Bennett, Brewers Droop, Indian Summer, Graphite, (and second from the bottom on the bill) Queen all appeared at the Tregye Festival Truro, Cornwall, England. Elvis Presley’s reissued single of “Heartbreak Hotel” hit #10 in the U.K.
Elvis Presley’s single “I’m Leavin’” hit #36 in the U.S.
Elvis cancelled the remainder of the 36 Vegas shows, and left the Hilton at 6.00 a.m. accompanied by Dr. Nick. They flew to Memphis, where Elvis was admitted to the Baptist Memorial Hospital, from exhaustion. The Rolling Stones, 10CC, Lynyrd Skynyrd, Todd Rundgren’s Utopia and Hot Tuna all appeared at The Knebworth Festival, Hertfordshire, England, tickets £4.50. It was announced by RCA Victor records that the sales of Elvis Presley records passed the 400 million mark. Lisa Marie Presley made her Grand Ole Opry debut where she wowed the sold-out audience by performing three songs from her current album, “Storm & Grace”. Just days after being fired from the Grand Ole Opry because of his drinking, and at the exact time he would have been singing at the Ryman Auditorium if he hadn’t been dismissed, country music singer Hank Williams was arrested in Alexander City, Alabama for being drunk and disorderly. Elvis Scotty and Bill played Bellevue Park in Memphis. “Don’t Be Cruel/Hound Dog” hit the number one spot on the pop music charts and stayed for eleven weeks. 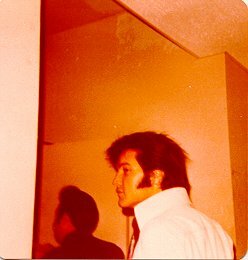 Elvis was photographed at the Knickerbocker Hotel, where he was staying. Italy’s leading male vocalist, Domenico Modugno, hit the top of the Billboard Hot 100 with “Volare” (Nel Blu Dipinto di Blu). The song would become the year’s best selling record and win three Grammy Awards. Military Leave: Elvis leave was extended for five more days. Texas DJ Eddie Fadal was in Memphis with Elvis and the Memphis Police Force took Elvis on a helicopter ride over the city to distract and cheer him up. Memphis Highway Patrol brought their new helicopter to Graceland and took Elvis on a flight over the city. 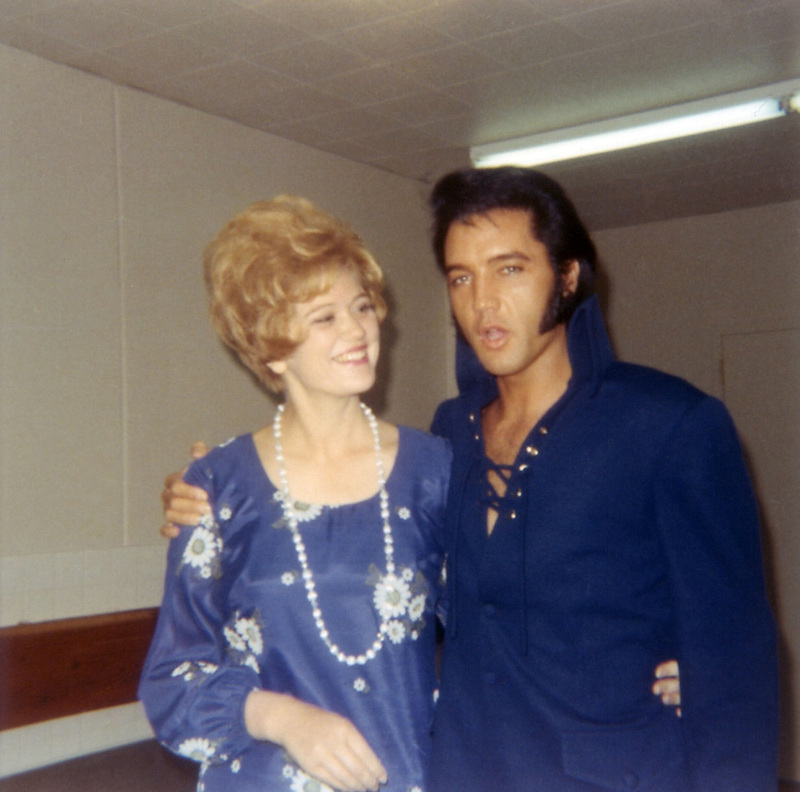 In Dallas, TX, Elvis Presley’s film “G.I. Blues” had a sneak preview. An estimated 1500 people gathered for the first Mariposa Folk Festival, a two-day event at Oval Park in Orillia, Ontario. Ian & Sylvia, the Travellers and Al Cherny performed. Ringo Starr made his debut with The Beatles at the horticultural society Dance, Birkenhead, England, having had a two-hour rehearsal in preparation. This was the first appearance of The Beatles as the world would come to know them: John, Paul, George, and Ringo. After two decades of working together, country music singers Ira Lonnie Loudermilk and his brother Charlie Elzer Loudermilk, known professionally as the Louvin Brothers, performed as a duo for the last time before starting solo careers. Ira was killed in a 1965 car accident. Charlie died of pancreatic cancer in 2011. 21-year-old Wayne Newton sees his rendition of “Danke Schoen” peak at #13 on the Hot 100. The song was originally intended for Bobby Darin as a follow-up to his hit single “Mack the Knife”, but after seeing Newton perform at the Copacabana, Darin decided to let him record the song. “I Who Have Nothing” by Ben E. King tops out at #29, becoming his fifth solo effort to reach the Billboard Top 40 since he left The Drifters in May, 1960. Other notable versions of the song became hits for Terry Knight And The Pack (#46 in 1966), Liquid Smoke (#82 in 1970 ), Sylvester (#40 in 1979) and Tom Jones (#14 in 1970). The Beatles fly across the Atlantic to begin their first full concert tour of the US, with the debut show slated for the following day at The Cow Palace in San Francisco. Opening acts included The Righteous Brothers, The Exciters, Jackie DeShannon and Bill Black’s Combo. Over 9,000 frenzied fans met The Beatles as they arrived in San Francisco, to begin an American tour. The Beatles were driven into a protective fence enclosure so that photographers could take pictures. As the 9,000 fans pressed against the fencing, it gave way, with The Beatles managing to get out split-seconds before it came crashing down. Elvis attended a windup party at the Polynesian Culture Center before he returned to the mainland the following day. Principal photography for Speedway was completed. The Woodstock festival closes after morning performances by The Paul Butterfield Blues Band, Sha Na Na and finally, at 9 AM, Jimi Hendrix, who performs his rendition of “The Star Spangled Banner”. Mick Jagger was accidentally shot in the hand during filming of Ned Kelly in Australia. The film was dogged by problems: Jagger’s girlfriend of the time, Marianne Faithfull, had gone to Australia to play the lead female role (Ned’s sister, Maggie), but the Jagger-Faithfull relationship was breaking up, and she took an overdose of sleeping tablets soon after arrival in Sydney resulting in being hospitalised in a coma, and pulling out of the film. According to Cashbox Magazine, Wings had the best selling single in the US with “Live And Let Die”. Produced by George Martin, the Grammy nominated song was written specifically for the James Bond film of the same name. 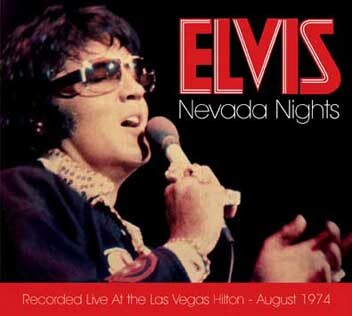 The album “Elvis” hit #52 in the U.S.
Elvis performed at the Showroom, Las Vegas Hilton, Las Vegas. After singing Polk Salad Annie, Elvis sat at the foot of Ronnie Tutt’s drums, when a female fan came onto the stage and gave a ‘panting’ Elvis ‘mouth-to-mouth resuscitation! The Police made their live debut as a three-piece band when they played at Rebecca’s Birmingham, England. The Police became globally popular in the late 1970s and are generally regarded as one of the first New Wave groups to achieve mainstream success, playing a style of rock that was influenced by punk, reggae, and jazz. Two Missouri girls were killed and a third was critically injured when a car being driven by drunk 18-year-old Memphis teen, Treatise Wheeler, with three teen girls in the car, swerved into a crowd of over 2,000 mourners standing in front of Graceland’s music gate at about 4am. Dragged and killed were Alice Marie Hovatar, Juanita Joanne Johnson while Tammy Baiter was seriously injured. The driver was charged with drunk driving, leaving the scene of an accident and two counts of second degree murder. More than 75-thousand mourners surrounded the estate for the funeral service of Elvis Presley at his Graceland estate in Memphis, Tennessee. Florists in the surrounding States were press for flower orders. An estimated 30,000 fans were able to pass by Elvis coffin during a Memphis Heat Wave. John Wayne, Caroline Kennedy, Burt Reynolds, James Brown, and George Hamilton. 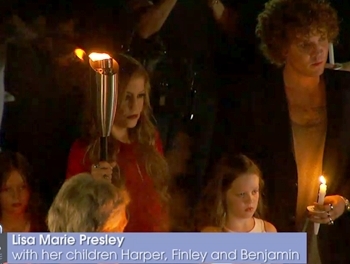 Kennedy showed up, not on behalf of her family, as Vernon Presley thought, but for Rolling Stone Magazine. Col Parker had a fight with Vernon over bootleg products and signing a new contract to protect Elvis; Parker wore overly casual clothes, and had declined being a pall bearer. An estimated 80,000 people came to watch the funeral procession, lining the street and bearing handmade signs expressing their sorrow for the loss of The King. To Forest Hills: Presley was entombed in a white marble mausoleum at Forest Hill Cemetery in Memphis near the grave of his mother, Gladys, but would be re-buried at Graceland the following November at his father’s request, and the City of Memphis re-zoned Graceland for a family graveyard. 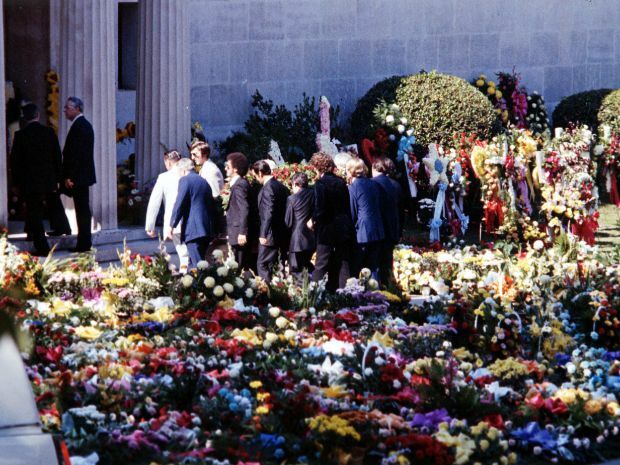 Elvis’ burial began with a white hearse followed by seventeen white limousines in a long procession down Elvis Presley Boulevard, ending at Forest Hill Cemetery. The 900-pound copper coffin was carried by pallbearers Jerry Schilling, Joe Esposito, George Klein, Lamar Fike, Billy Smith, Charlie Hodges, Gene Smith, and Dr. George Nichopoulous. In the mausoleum, a small service was held, then the paying of respects from family and friends. Elvis’ father Vernon was the last to leave, kissing the coffin and repeating “Daddy will be with you soon.” Elvis was interred at 4:30 p.m. CST. Vernon with Sandi Miller, and Joe Esposito. SNL’s Bill Murray was there. The City of Liverpool named four streets after The Beatles, John Lennon Drive, Paul McCartney Way, George Harrison Close and Ringo Starr Drive. US film-maker Adam Muskiewicz set up elviswanted.com as part of a documentary exploring the myth that the singer was still alive and offered a $3m (£1.59m) reward for anybody who found Elvis Presley alive. The film was due for release in August 2007, to coincide with the 30th anniversary of Presley’s death. 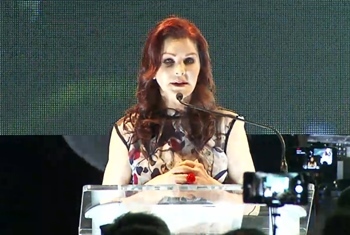 It was announced the Lisa Marie Presley had founded a new organization called Presley Charitable Foundation. It was created to help people in need. The first Presley Place was in New Orleans, LA. Scott McKenzie, who sang the US #4 hit “San Francisco”, the unofficial anthem for “the summer of love” in 1967, died of the nervous system disorder Guillain-Barre Syndrome at the age of 73. Ed Sheeran’s album X notched up eight weeks at No.1 on the UK chart, becoming the joint longest chart-topper by a male solo artist. The last man to achieve the feat was James Blunt for his 2005 collection Back to Bedlam. ELVIS WEEK 2017 – DAY 6– EIN exclusive report: ‘C’mon Everybody’ and watch out Memphis because Sanja Meegin, EIN’s roving reporter, is back in the Promised Land once again to give us all the inside scoops on Elvis Week 2017. Yesterday Sanja spent the whole evening at the Candlelit Vigil and Meditation Gardens on a emotional summer’s night. It was all the more emotional with Lisa Marie plus her children and Priscilla being there to say a special Thank You to all the fans. The American Federation of Radio Artists (AFRA) was organized as a part of the American Federation of Labor. On September 17, 1952, the Television Authority and AFRA merged to create a new union, the present-day American Federation of Television and Radio Artists (AFTRA). Elvis left Memphis on an American Airlines flight for Los Angeles where he reported to 20th Century Fox for pre-production meetings for his first movie: The Reno Brothers, based on a true story and would be renamed “Love Me Tender” and the second movie version in the same time period. Buddy Holly And The Crickets played the Apollo Theatre in Harlem and were booed by the mostly Black crowd who were expecting to see an R&B group that also used the name ‘The Crickets’. By the end of the night however, the audience was cheering for the Lubbock, Texas band. Also on the bill that night were Roy Hamilton, Shep And The Limelites and Clarence “Frogman” Henry. For his first effort at Imperial Records, Ricky Nelson records “Be Bop Baby”, which already has 750,000 advance orders. The song will go on to sell over a million copies and reach #3 on the Billboard chart. Military Leave in Memphis: Elvis attended the funeral of Red West’s father. He was overcome with emotions and later in the afternoon he visited his mother’s grave. Flaming Star : Principal photography began at Conejo Movie Ranch in Thousand Oaks, California. Peter, Paul And Mary released their first US Top 10 hit, “If I Had a Hammer”, a standard Folk song that had been around since 1949. Little Stevie Wonder (aged 12), released his first single, ‘I Call It Pretty Music, (But The Old People Call It The Blues)’, the single featured Marvin Gaye on drums. Brian Epstein told Pete Best that the other Beatles wanted him out of the group, and that he was being replaced. Epstein then asked Best to perform with The Beatles that night at the Riverpark Ballroom in Chester, Cheshire. Pete Best does not show up, drummer Johnny Hutchinson of The Big Three filled in the temporary vacancy. Elvis received a telegram from the president of Capitol Records inviting him to a cocktail party in Los Angeles on the 24th, to meet the Beatles. Working at Abbey Road studios on The White Album, The Beatles recorded 14 takes of the new George Harrison song ‘While My Guitar Gently Weeps’, taking the song from its early acoustic version into an electric version. The Jackson Five made their formal debut with Diana Ross and The Supremes at the Great Western Forum, California. Bruce Springsteen’s new band Earth made their live debut at the Off Broad Street Coffee House in Red Bank, New Jersey, admission was 75c. The lineup of the group consisted of Springsteen (guitars & vocals), John Graham (bass), Michael Burke (drums) and ‘Flash Craig’ (organ). The group only had a 6-month existence. During a North American tour Led Zeppelin appeared at the Convention Hall in Asbury Park with Joe Cocker as support. Zeppelin had been asked to perform at Woodstock but due to this gig commitment were unable to attend. And down the road Bruce Springsteen’s band Child played the first of two shows over two days at the Student Prince, Ashbury Park. Springsteen was also unable to attend Woodstock due to these gigs. This week’s UK Top 5 singles: No.5, Free, ‘All Right Now’, No.4, Shirley Bassey, ‘Something’, No.3, Hotlegs, ‘Neanderthal Man’, No.2, The Kinks, ‘Lola’ and No.1, Elvis Presley, ‘The Wonder Of You’, (his 16th UK No.1). Peter Gabriel announced that he was leaving Genesis. The group auditioned more than 400 singers during the next 18 months before deciding that Phil Collins, who had been the drummer for Genesis since 1970, could front the band. Noon rehearsals were held each day for three days in preparation for the Vegas opening. 12:00 midnight: After his 10:30 pm dentist’s appointment is completed, Elvis and girlfriend Ginger Alden return to Graceland. 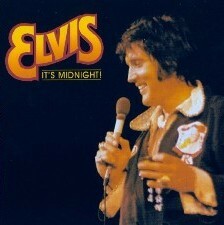 2:15 am: Elvis calls his doctor to request more painkillers, ostensibly because of pain engendered by the dentist trip. Elvis’ stepbrother Ricky Stanley drives to the all-night pharmacy at Baptist Memorial Hospital and returns with six Dilaudid pills. 4:00 am: Elvis wakes up first cousin Billy Smith and his wife, Jo, to request they play a game of racquetball with him. Presley, as usual, plays the game while barely moving, and playfully attempts to hit Billy with the ball. In doing so, Elvis manages to hit himself with his racquet, bruising his leg. The game is called off. 5:00 am: Elvis decides to turn in early (for him), going up to his bedroom with Ginger. He takes one of the pre-packaged packets of pills created by his doctor for twice-daily use. 7:00 am: Elvis takes a second pack of pills. 8:00 am: Still unable to sleep, Elvis asks for a third packet, which is brought to him by his aunt, Delta Mae Biggs. 9:30 am: Elvis takes the book he’s been reading, Frank Adams’ The Scientific Search For The Face Of Jesus, and goes into his bathroom, “Don’t fall asleep in there,” she says, knowing his propensity to nod off. “Okay, I won’t,” he says. Ginger, who Elvis gave a Tylenol 3 tablet, drops back to sleep. -at some point, Elvis had ice cream and cookies and more Pills, with his Aunt Delta likely being the last person to see him alive. 1:30 pm: Ginger awakens and sees Elvis is still gone. When knocking on the bathroom door produces no reply, she enters and finds his lifeless body on the floor in front of the toilet. She calls downstairs for help and Nancy Rook, Graceland Maid answers and dispatches Elvis associates Al Strada and Joe Esposito, who arrive in the bathroom and they call the fire department. An ambulance is dispatched. Daughter Lisa Marie and father Vernon arrive in the bathroom, but Lisa Marie is quickly removed from the scene. 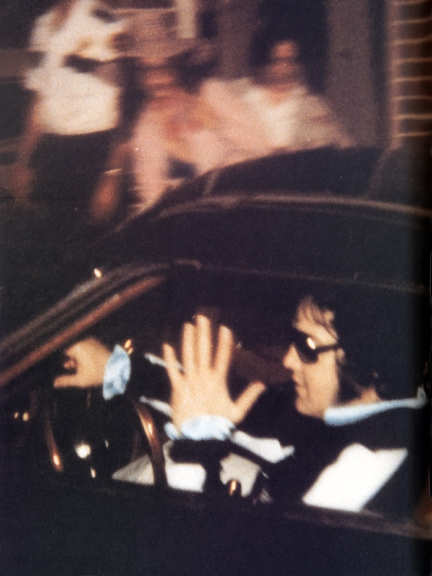 2:56 pm: Elvis Presley arrives at the Baptist Medical Center in Memphis. 3:00 pm: Elvis is pronounced dead. His autopsy was performed at 7:00 p.m. The death was announced as the autopsy was being carried out: The official coroner’s report listed “cardiac arrhythmia” as the cause of Presley’s death, (which only means the heart stopped and not why) but the real cause of death: a cocktail of ten prescribed drugs, taken together in doses no doctor should ever prescribe to a person with terminal illness, which Elvis did not have. The pills he took were for symptom management: pain and sleep mostly, nothing for an actual medical condition. Also on Memphis Mafia duty during the final hours were Stepbrothers David E. Stanley and Rick Stanley. One delivered pill packs and the other was smoking pot with a pal in the pool table room, off the TV room. The staff of television newsrooms considered Elvis’ death a late-breaking story. There was not enough time for TV reporters who had been sent to Memphis to file stories for the evening news. Executives had to decide quickly what film footage they could use from their files and where to place the story in relation to the other news of the day. NBC-TV not only rewrote their news lineup to lead off with the story of Elvis’ death, but the network also made immediate plans to delay The Tonight Show and put together a late-night news documentary. David Brinkley, a national news anchor for NBC at the time, opened his broadcast with three minutes devoted to Elvis’ sudden death. ABC-TV also decided to lead with the Presley story. When they learned that NBC would be doing a late-night news special about the significance of Elvis Presley to American music, ABC announced that they would also air a half-hour documentary. CBS did not follow suit, however. The CBS Evening News with Walter Cronkite, featuring the most respected man in broadcasting at that time, had led the news program ratings for more than a decade. CBS executives chose not to open the evening broadcast with the Presley story. Arbitron’s records indicate that when millions of viewers realized this they immediately switched the channel to another network. The CBS decision not to lead with Elvis’ death gave the CBS Evening News its lowest ratings in years. (For the record, Roger Mudd was substituting for Walter Cronkite that evening.) CBS devoted only 70 seconds to its story on Elvis, placing it after a lengthy segment on the Panama Canal. The producer for that evening’s news was vehemently opposed to leading off with Elvis’ death, in spite of other members of the CBS programming staff suggesting it repeatedly. Interviewed later, the producer agreed that he was out of sync with the national consciousness. Two days later, CBS tried to save face by putting together a documentary on Elvis. Radio Luxembourg was the first radio station in Europe to announce Elvis’ death.At 11pm Mark Wesley reads the news and announces Elvis’ death, and then it’s the Tony Prince show. Prince, close to tears at times, devotes his entire show to Elvis, finishing at 3.45am. the Producer was Joan Deary, who started at RCA the same year as Elvis, but she was a secretary then. 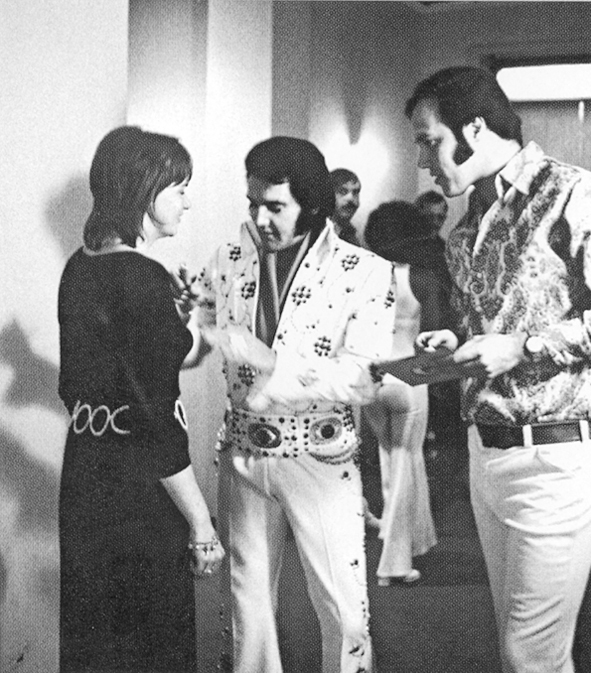 In 1973, she recorded the Aloha Concert for RCA and she was the last RCA producer known to Elvis Presley. Will Smith started a four-week run at No.1 on the UK singles chart with ‘Men In Black’ taken from the film of the same name. The song won Smith a Grammy in 1997 for Best Rap Solo Performance. Elvis Presley, via video, starred in “Elvis in Concert ’97.” Over thirty of his former TBC bandmates made appearances. On the 20th anniversary of Elvis Presley’s death, over 30,000 fans descended on Memphis, Tennessee for a 10 minute mourning, circling his grave. A poll found that almost a third of the fans were keeping an eye out for him in the crowd. 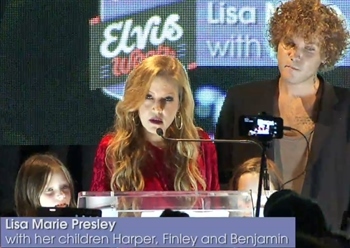 In Memphis, TN, Lisa Marie Presley introduced a recording of “Don’t Cry Daddy” The event was the last day of a 25th anniversary concert, the first of three Father/Daughter duets – following on the Hank Williams Sr/Jr and the Nat King and Nathalie Cole post-humus duets. 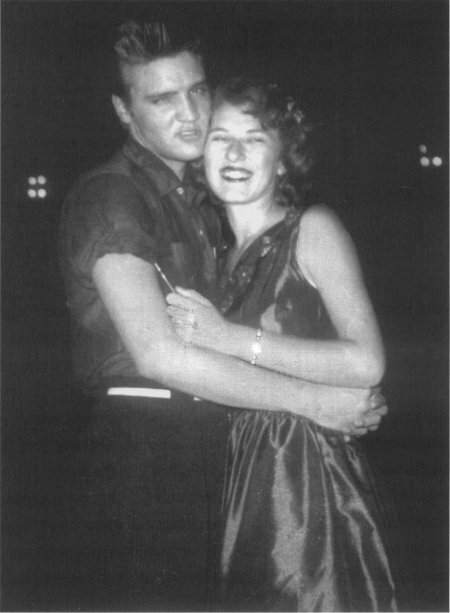 Released: The true story of Elvis’ first fiancee, June Juanico. This documentary featuries the oldest home movie of Elvis in a private setting…on vacation in Biloxi, Mississippi with June in the summer of 1956. 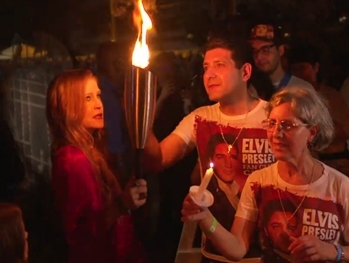 Thousands of silent mourners paid their respects to Elvis Presley at his gravesite at Graceland, on the 34th anniversary of his death. 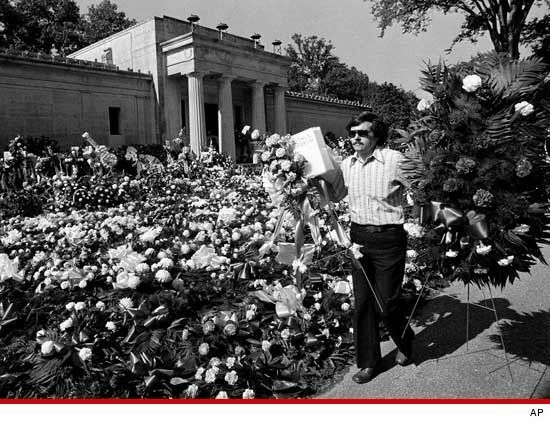 Flower arrangements and heart-shaped wreaths decorated the burial site as Presley’s music played softly in the background. “My Brother Elvis” by David E. Stanley was published. British GQ– Still stylish, however, and few men have worn sunglasses better than Presley. Getty Images. Leaving Philadelphia International Airport in 1974. The costumes are now a permanent fixture. Getty Images. Live onstage in 1975 in the Nassau Coliseum once again. The costumes are going full Liberace. ELVIS WEEK 2017 – DAY 5– EIN exclusive report: ‘C’mon Everybody’ and watch out Memphis because Sanja Meegin, EIN’s roving reporter, is back in the Promised Land once again to give us all the inside scoops on Elvis Week 2017. This is Sanja’s 18th visit to Memphis and Elvis Week, and as we head to the Candlelight Vigil she spent the day looking around Memphis to check out all those more obscure ELVIS connections such as Anita Woods house, Sam Phillips recording studio, Khang Rhee’s karate studio just to name a few.. and then to the Strictly ELVIS dance party..
Rock and roll legend Elvis Aaron Presley died on Aug. 16, 1977. The headline in The Patriot the next day said, “‘Mr. Swivel Hips,’ Presley, 42, . … dies on anniversary of fellow rock ‘n’ roll icon Elvis Presley’s death … the 41-year anniversary of Elvis’ death, who was found dead in 1977.